I wish you could have seen the original versions of our Easter Sunday bulletin cover. I had sent our volunteer designer these three keywords to run with: lamb, blood, and doorpost. A few hours later I got the first proof, which I thought looked really cool. It was a picture of lamb with blood smeared at the top, and then a few drops of blood at the bottom. After sharing the image with a few others, we decided the blood might cause nightmares among the First Fruit Farm kids (not to mention the adults), so we went with a non-bloody version and went to print. Our reason was simple; non-bloody bulletin covers are less awkward to hand out. What is it about blood that turns our stomachs? What causes the feeling of disgust when a bloody deer carcass is in the middle of the interstate? It’s because blood has to do with life, and the sight of blood has to do with death. For this reason, Israel was forbidden to drink blood, and anyone who did would be cut off from the people (see Leviticus 17:14). God created life to be precious, and the sight of blood meant life was passing away. Blood meant the opposite of life. Blood meant death. So for all these reasons, we opted for a non-bloody Easter bulletin cover. But for these same reasons, we cannot opt out of a non-bloody gospel. For at the very center of Christianity stands a bloody cross, that then leads to an empty tomb. This is how the Passover lamb in Exodus 12 points to the gospel of our Lord and Savior, Jesus Christ. 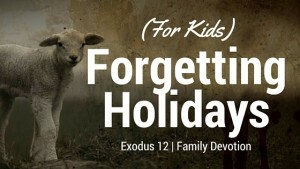 For in the Exodus, the Israelites killed spotless lambs and smeared their blood on the doorpost of their houses. As the angel of death came to judge Egypt by taking the lives of all the firstborns, Israel would be passed over because of the blood. In order words, the Israelites would escape death because a death had already occurred for them; the death of an innocent lamb. And the same is true for God’s people today. We escape the death we all deserve because of our sins, because a death has already occurred for us. Not the death of an innocent lamb, but rather the death of God’s own innocent Son. 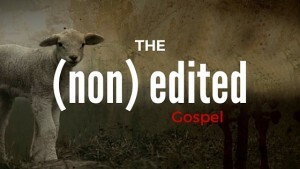 And that’s why on Easter it’s ok to edit the blood off our bulletin covers, but it’s not ok to edit the blood off our gospel. Because without the blood, there is no gospel. So this Easter, let’s remember the empty tomb and the blood that lead there. Because unlike the sacrificed lambs in Exodus, Jesus didn’t remain dead, but He came back to life and He lives forevermore. And because He lives forevermore, so can we!